A miniature or model is a physical representation of an object or device of larger size. A miniature maintains the proportions and details of the original object, but is scaled for practicality and display. Miniatures and models have appeared in cult-television series throughout history. Sometimes the models and miniatures used on camera are actually the very ones used in special effects shots to represent the larger object. 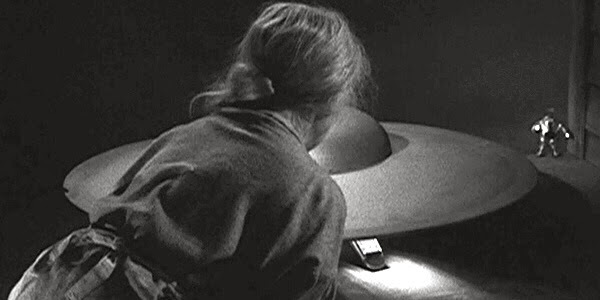 In The Twilight Zone’s (1959 – 1964), “The Invaders” for instance, a United States spaceship -- which resembles a flying saucer -- is actually the on-camera miniature of the starship from Forbidden Planet (1956). This model is meant to represent a full-sized ship, however, in a world of giants, not a model. In Star Trek (1966 – 1969), in the third season story “Requiem for Methuselah,” a long-lived man, Flint (James Daly) shrinks the Enterprise down to the size of a model-kit, and the vast craft is represented by the miniature used by the special effects department. 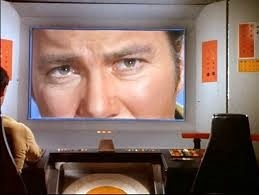 Captain Kirk approaches it, and looks in through the view-screen -- window? -- at his miniaturized crew. In The Starlost, the full-scale miniature of the Earthship Ark is seen in a scientific laboratory in the episode "Farthing's Comet." Importantly, the ark looks more detailed, and more realistic than it does in many of the series' actual space shots. 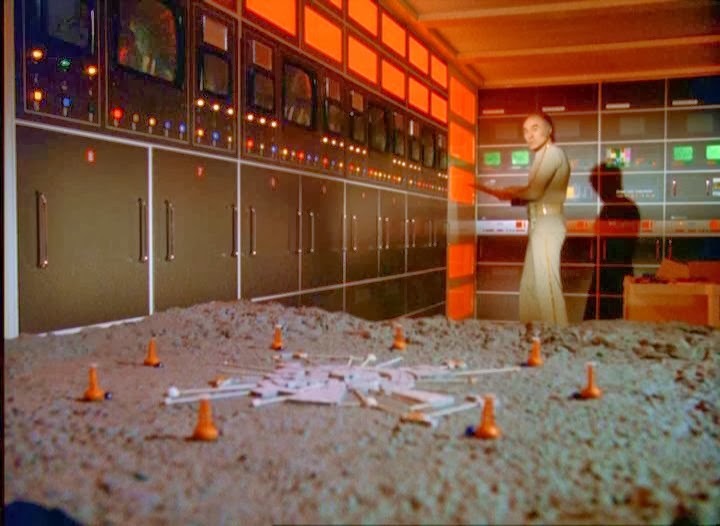 In Space:1999 (1975 – 1977), in the Year One tale “The Black Sun,” Victor Bergman demonstrates his new force field invention using a model or miniature of Moonbase Alpha, and its perimeter towers. 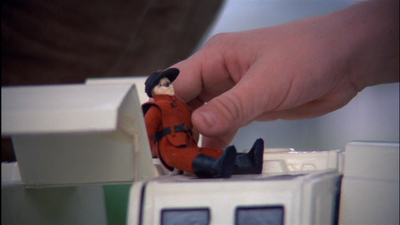 In Kenneth Johnson’s V (1983), Mike Donovan’s (Marc Singer) son is seen playing with a miniature Visitor shuttle (replete with Diana action figure! 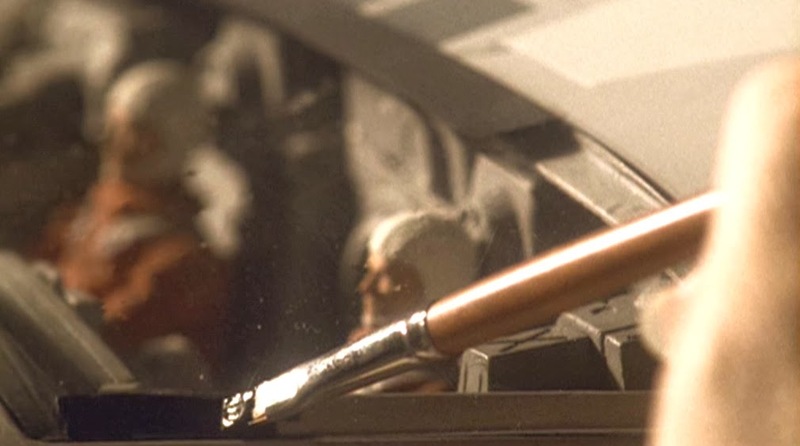 ), and as is the case in other settings, the detailed toy or model appears to be the shooting prop. 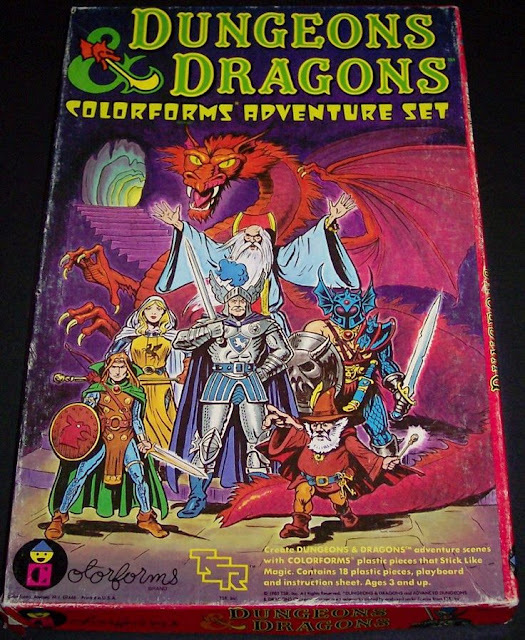 Sometimes, models or miniatures are simply meant to reflect a character’s affections for a certain ship, or affinity for models (and building model kits). 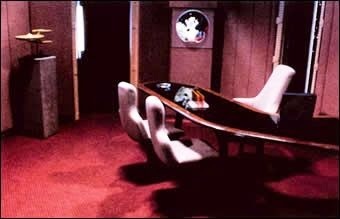 For instance, a model of Captain Picard’s first command, the Stargazer, is seen throughout Star Trek: The Next Generation (1987 – 1994) in his Enterprise-D ready room. Similarly, in The X-Files (1993 – 2002) episode “Space,” Mulder and Scully visit NASA and question a colonel, Marcus Aurelius Belt (Ed Lauter) who keeps models of historic space craft on his desk. In the last Star Trek series, Enterprise (2001 - 2005), Captain Archer is depicted as a boy, building a model of a warp spaceship. We see him applying paint to the vessel in the series premiere, "Broken Bow." Here, a boy traveling across an island in The Bermuda Triangle, Scott (Ike Eisenmann) sees a model of a spaceship, and learns that it is an alien colony ship. This Materran space vessel, however, is actually NASA’s very recognizable space shuttle and booster rockets! Fun posting, John. Just one thing, however: you state, "... (the shrunken Enterprise) is represented by the miniature used by the special effects department". 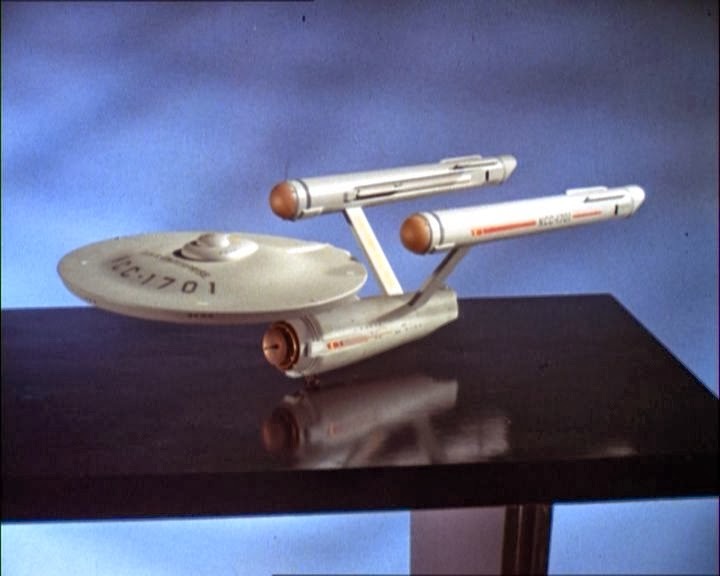 In fact, the frame capture from the Star Trek episode "Requiem for Methuselah" shows the 33-inch "study-model" of the Enterprise. The optical houses used the 11-footer (132-inch) for almost all of the Enterprise shots; there were a few exceptions... some shots in the opening title sequence from "The Cage", for example. Your inclusion of the frame from Space: 1999 reminded me that a few weeks ago I read on a 'board' that Space: 2099 has basically no lineage from the original show. The show-runner, Jace Hall, announced that the new, anticipated, take is not a re-imagining, sequel, or remake of 1999. It's a totally new series.